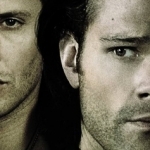 The mid-season finale of Supernatural is upon us and with it is the potential of things to come. Sometimes we go into the winter hiatus with a cliffhanger. This time around, we got teasers of what we’ll be up against in the back-half of the season and there’s lots to think about. 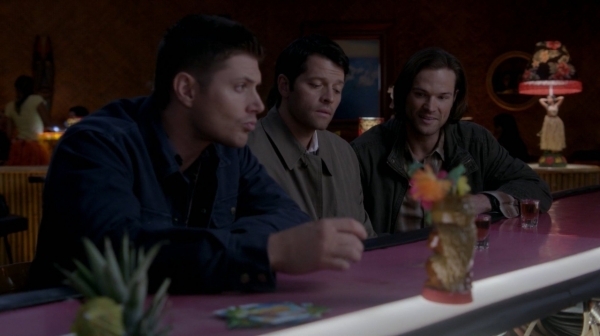 The theme of the night was certainly parental issues, with Cas and Crowley and the Winchesters all getting into the act. This show has long delved into the impact parents have on their children, and what long-lasting damage they can cause. We got to see that illustrated in full force between the three focuses here. First up, there was Crowley and his mom. I love Rowena, and this episode just brought that love on even more. She is a fantastic character, and so manipulative. Rowena is the female version of what I love in Crowley. You know she’s bad, but you love her wicked ways. You can certainly see where Crowley gets it from. To see her twist up her little boy into all different shapes, just to get her way, was perfection. The best illustration of her personality, and one that had me laughing out loud, was the name exchange. She will not call her boy Crowley, no matter what he wishes, because she holds the power over him. I look forward to seeing how she continues to do so with both him and the others in the upcoming episodes. There’s just nothing like a mother’s love, even when it’s tainted with poison. 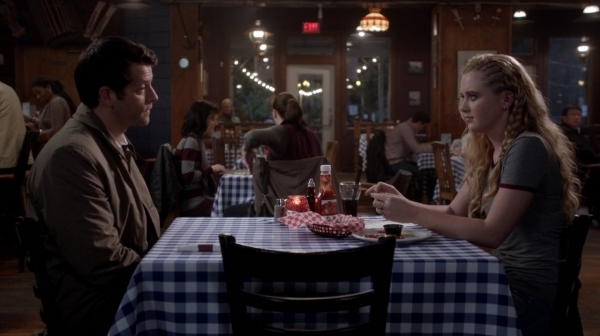 And on the opposite side, we got Castiel trying to be a good father figure for Claire. She has certainly grown up to be a messed up teenager, huh? But with an absent mother and a father who got possessed by an angel, you have to expect that she would be negatively affected. I hope that Claire can come out of this and get her life back on track, despite her sordid past. The father figure she took on, Randy, was not such a good influence and it showed. As an aside, though, it took me way too long to recognize Roark Critchlow as the character. You would think, with as much as I love Mike Horton, that I could recognize him on sight… but alas, he has changed and the glasses threw me off. Anyway, I liked that Cas was trying to reach out, to make things better for Claire, but that it’s not going to be an easy road. She is deeply damaged, and a quick hug isn’t going to fix it. The one good revelation that came out of their reunion was the confirmation that Jimmy is now residing in Heaven. At least he got his reward for all the pain Cas has caused him, though Heaven isn’t such a rewarding experience as of late. Speaking of fatherly figures, it was good to take that trip down memory lane and recall John. It’s nice to see not only Dean remembering his father fondly, but also Sam. For all of John’s faults, he did try to be a good protector and a good provider. He just went about it in a very strict, military sort of way. John was on the path of vengeance, and sometimes his boys paid the price for that. He did what he thought was best, even if it always wasn’t. 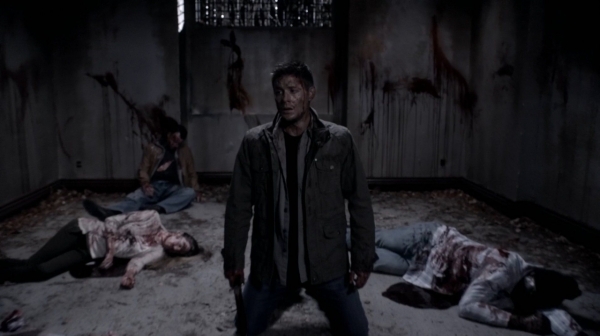 If only John could see his boys now, especially Dark!Dean. There is speculation that John may return, and I would welcome it if it were to happen. So much potential there. 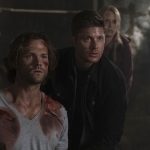 I am really loving the fact that they’re continuing the Dark!Dean storyline, especially seeing how it affects not only Dean but those around him. Poor Sam. Dean knows he’s got the risk of going dark again, and he needs reassurance from Cas that the angel will take care of him permanently if it comes to that. I hope Cas doesn’t make good on that, since we saw how far off the deep end Dean has gone now. 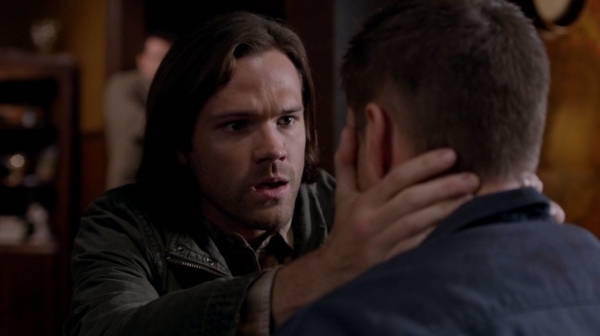 Sam just wants reassurance that it wasn’t the Mark, that Dean was forced to slaughter everyone, but Dean cannot give his brother that peace of mind. He is controlled and, unless something can be done about it, he will continue to slip right back into his old patterns. So, there are some good teasers for things to come, even if the cliffhanger nature wasn’t so strong as I was expecting. Onward through hiatus! I can’t wait to see what they have in store for us next.